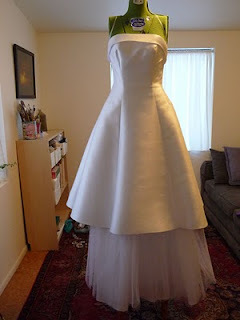 I have been having a great time working on this 1950s-themed wedding alteration! 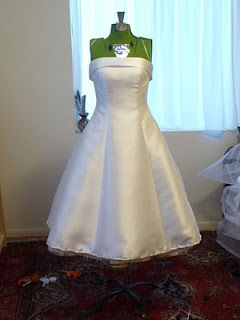 The dress is so cute and I made some great hair and shoe clips to go with the outfit. First I will show you the progress of the dress! 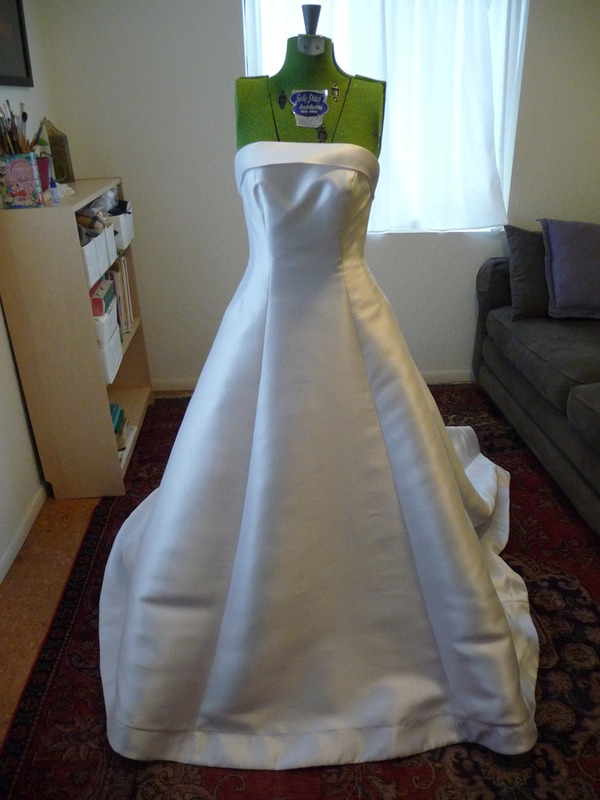 Here is the dress before I made any changes. It has such great classic lines and is made of a really nice heavy-weight textured satin. 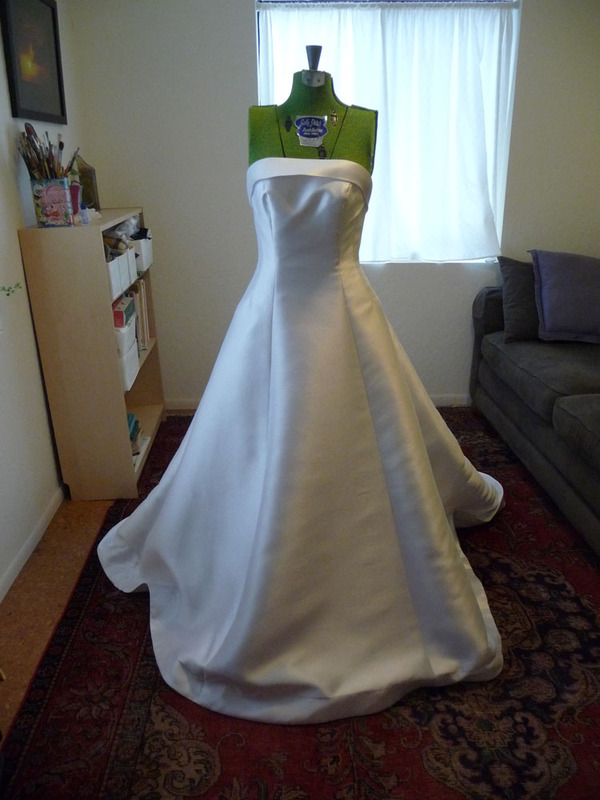 Here it is after I cut off the top layer of fabric! I put the dress on a pedestal so I could measure up from the floor to get the height even all around. That was especially important around the train. And here it is after all the fabric has been cut! Look at how much fabric I have left! I love the dress short, it is so cute. 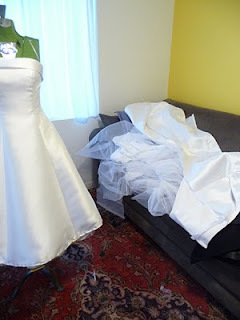 And I am glad the bride requested a matching bolero out of all the fabric! I will post photos of the bolero later! As I mentioned, I also made a custom hair clip and shoe clips. The bride is using lemon yellow as her accent color and her groom and bridesmaids are wearing navy blue, so the hair and shoe clips incorporate those colors. 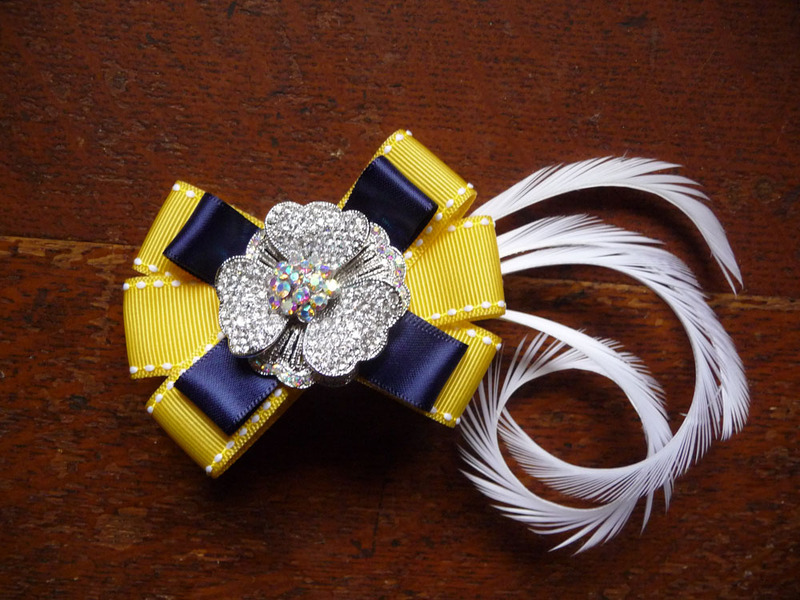 I couldn't find navy grosgrain ribbon with white stitching on the edges anywhere, so I just hand sewed it myself! I think it was worth it! 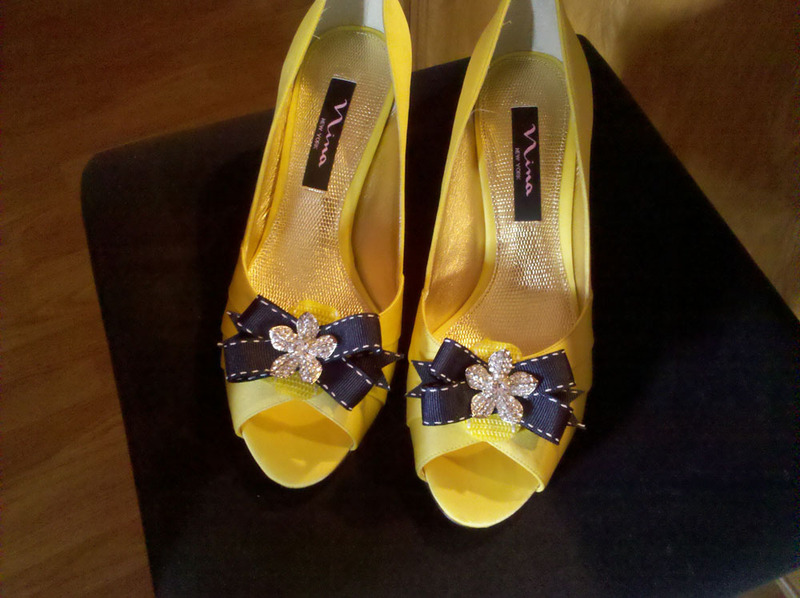 And here is a photo of the shoes with the shoe clips! 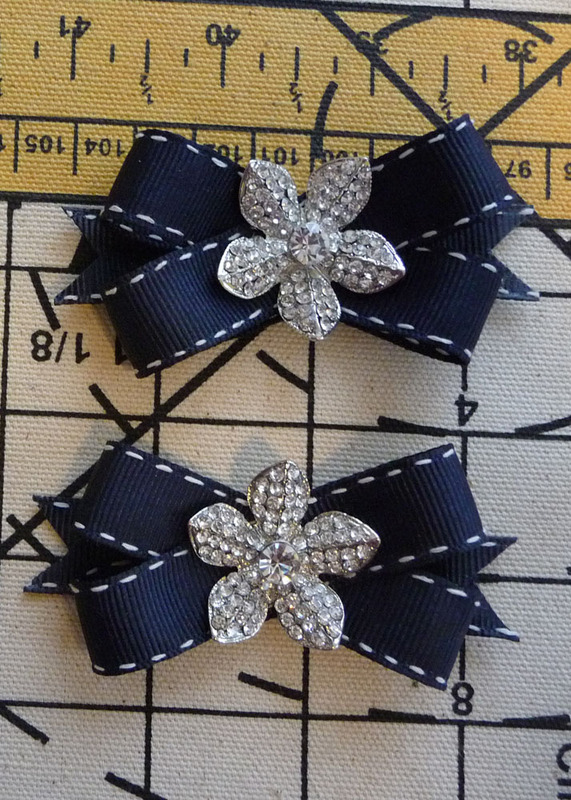 I will be listing hair and shoe clips like these for sale on etsy! You can contact me directly if you are interested in custom items like these and remember I can make them in any color ribbon! Although women's fashion gets a lot more attention, men need to look good too! To most people, a suit is a suit is a suit, but men's fashion has changed a lot over the years. I think every man needs a good suit in his life, but there is no need to run out and spend big money on a boring suit that doesn't express any personality. Think vintage! (I always do...). 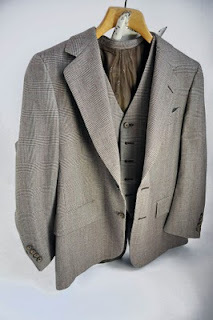 Lately vintage or vintage-look suits are appearing in movies, weddings, and even in new suits by modern designers. I personally really like the three-piece suit look. A vest provides a great option when you want to look tailored but you don't want to wear a jacket (think summer weddings and events). The character of Will Shuester on "Glee" is always wearing great partial suit outfits. 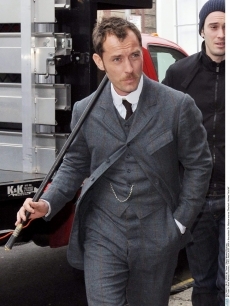 Jude Law sports a gorgeous three-piece suit in "Sherlock Holmes". JCrew offers a similar charcoal suit that would be perfect for an outdoor wedding. But there is really no need to spend so much money on a new suit. Before investing in an expensive, new coat, try to find a vintage one. 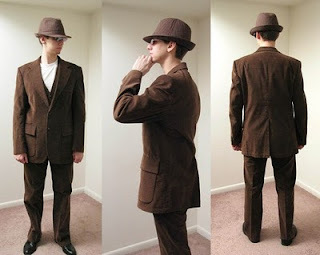 Check out etsy, ebay, or your local thrift, vintage or consignment stores for great suits that can be altered to fit! To be sure a jacket fits you properly, check first that the shoulder seams rest right above the edge of your actual shoulder. Next, button the jacket. If the fabric pulls when it is buttoned, the jacket is too small. Look for jackets with vertical seaming in the front and the back because this allows a tailor plenty of options for where a jacket can be taken in. A few alterations can extend the life of an otherwise dated and un-usable suit! Don't forget that tailoring can make anyone look like a million bucks! Don't forget that I can always provide fashion advice if you need help determining which suit styles are best for you!